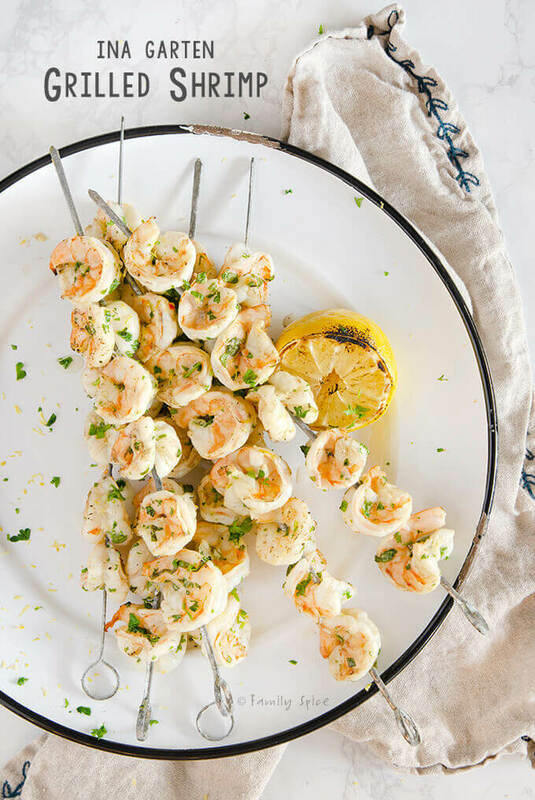 Ina Garten Grilled Shrimp Kabob requires little effort and yields a moist and juicy shrimp that tastes great the next day – if you have any leftovers. Love kabob? Try my Persian kabob recipes. During the summer months we are always outdoors enjoying the long sunny days. That means biking, swimming, frolicking on the beach and of course, grilling! We grill everything and love to eat outdoors, too. 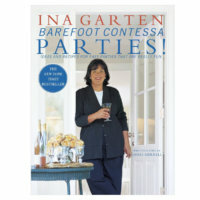 I am always on the lookout for easy recipes during the busy weeknights. Although you might think we’d have more free time over the summer, it’s like we’re even busier! So when I find an easy grilling recipe that the whole family loves, you know it’s making the meal rotation. 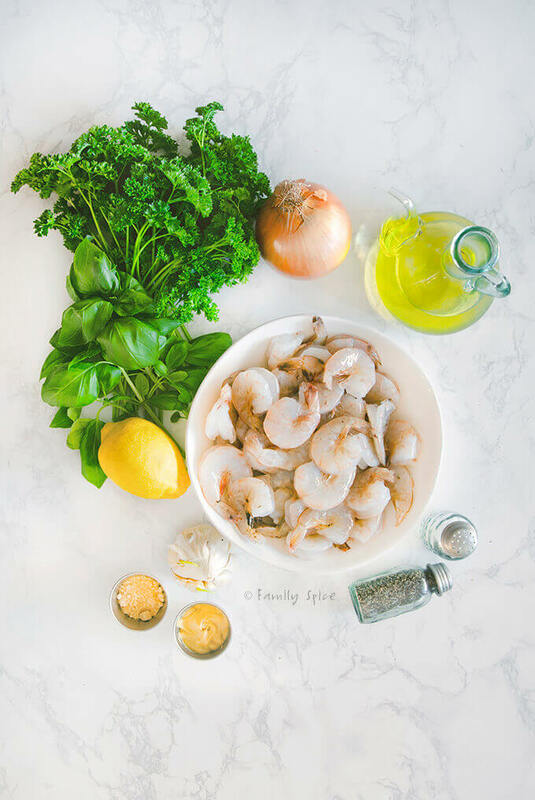 If you love shrimp, then there is no excuse to not make this Ina Garten Grilled Shrimp. 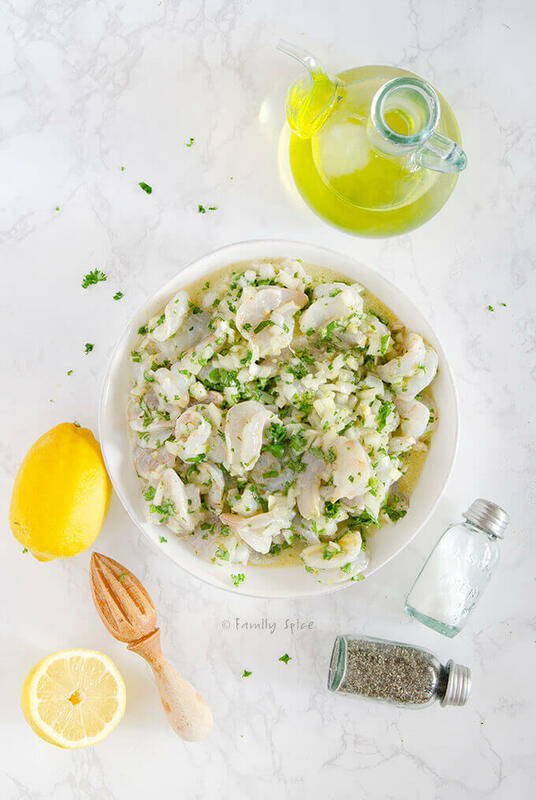 It is super, ridiculously easy, marinates quickly and is so friggin’ delicious you won’t believe how little effort it took to make such a delicious meal. This marinade only requires a minimum of an hour to sit together, unlike most marinades that require the meat to sit in the marinade all day or overnight. Despite the hour marinating time, you still end up with plump shrimp that tastes incredible. Ina always like to butterfly the shrimp, because it gives you more surface are for the meat to grab hold of the marinade. This increases the flavor factor. She recommends butterflying shrimp in her baked shrimp scampi recipe, too. Can you skip the butterflying step. Sure. We all have lazy streaks and I get this extra step can be a pain. But honestly, it’s well worth the extra few minutes of sliding that pairing knife down the back of the shrimp to butterfly it. Once butterflied and marinated, the shrimp is ready to be skewered. 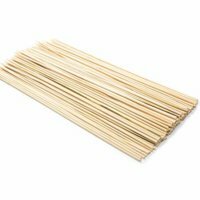 If you are using bamboo skewers like I do, do soak them in water for a minimum of 30 minutes. This prevents them from burning on the grill. 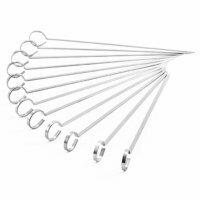 You can also use metal skewers, if you have any on hand. Shrimp cooks very quickly, especially on the grill. So don’t be surprised to have all these done and ready in 5 minutes. You know your shrimp is cooked because they turn pink at the edges and opaque white in the center. Do not overcook your shrimp, otherwise they will lose all of their moisture, shrivel up and turn into a rubbery mess. Shrimp is expensive, so fight the urge to cook them for too long. If you are serving it as an appetizer, I suggest leaving the tails on so that they are easier to grab. As a main dish, you can serve these grilled shrimp kabobs a number of different ways. I like to keep things healthy and serve it with a fresh green salad – my perfect summertime meal! You can also wrap in lavash or a hoagie roll to make a sandwich or po boy. You can also serve with some rice, which is how my kids like to eat the shrimp. However you do serve these grill shrimp kabobs, beware. Your guests will not be able to have just one or two. Although I suggested that 1-pound of shrimp would feed 4 for dinner, if you have my family, you’ll probably need to make more! This recipes is THAT GOOD! 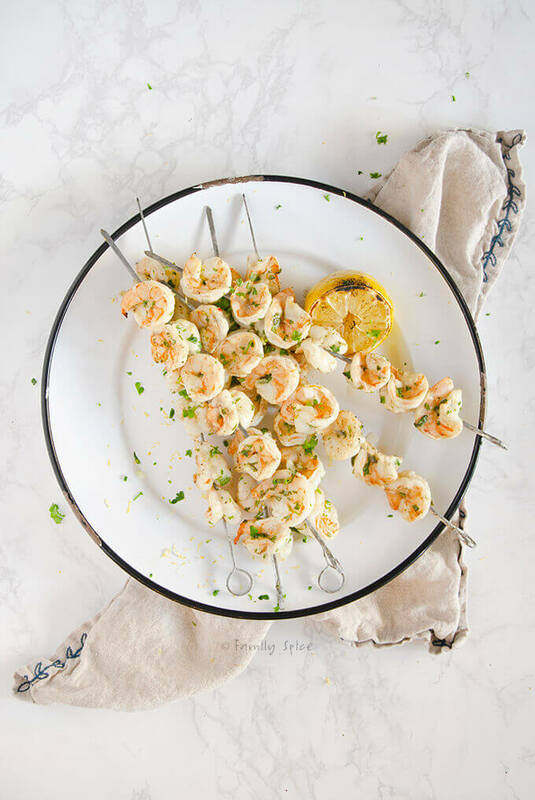 Ina Garten Grilled Shrimp Kabob requires little effort and yields a moist and juicy shrimp that tastes great the next day - if you have any leftovers. Wash shrimp and drain in a colander. Peel, devein, and butterfly the shrimp, leaving the tails on or off. In a medium-sized bowl combine remaining ingredients to prepare the marinade. Add in shrimp and massage until all shrimp is coated in marinade. Marinate for 1 hour at room temperature or cover and refrigerate for up to 2 days. Soak wooden skewers in water at least 30 minutes prior to grilling to prevent them from burning up on the grill. 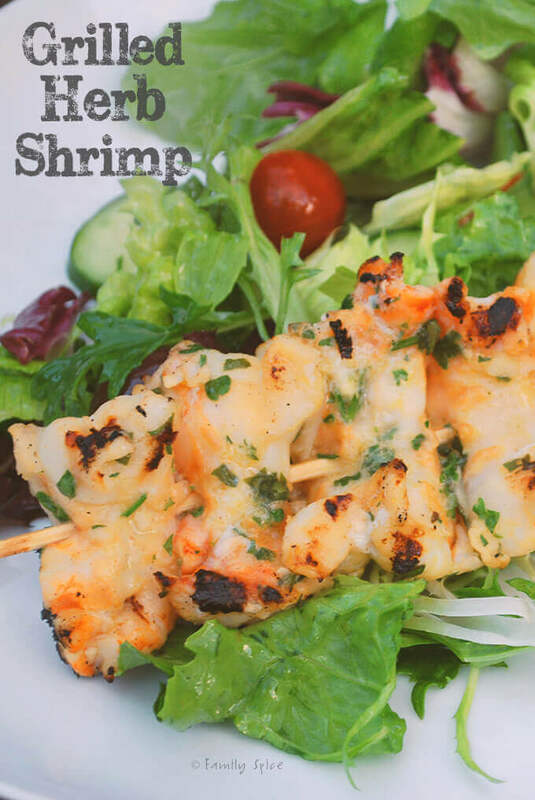 Skewer the shrimp by placing 3 or 4 shrimp on a 12-inch skewer for dinner. 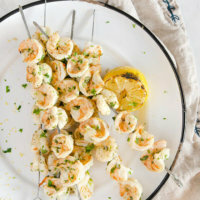 Slide shrimps onto wooden skewers, leaving room on each end of the skewer to handle without burning yourself. Heat a grill with coals and brush the grill with oil to prevent the shrimp from sticking. 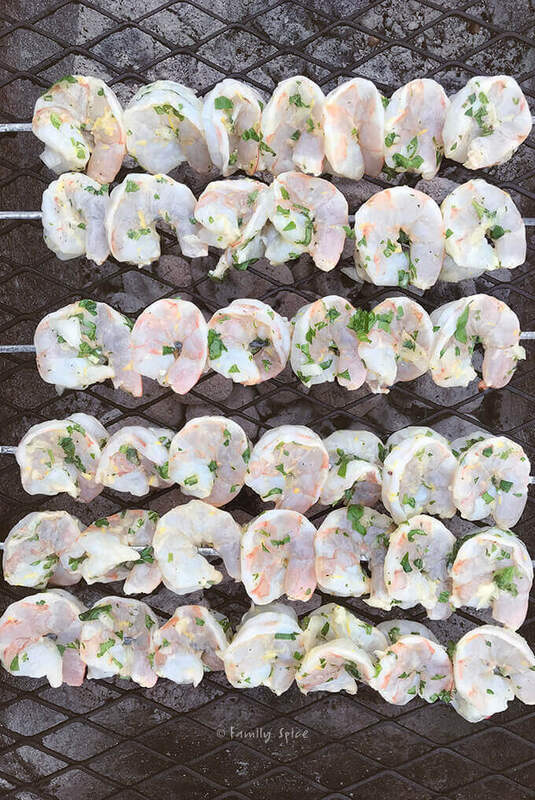 Grill the shrimp for only 2 minutes on each side, or until all shrimp are pink in color. Remove shrimp from grill and serve. Serving Suggestions: Keep the tails on or off. Serve as an appetizer or for dinner. Pictured above is butterflied shrimp.